The leaves are starting to turn on campus, and one of the first species is also one of my favorites. Black Maple, Acer nigrum, is a tree I didn’t even know about before I began working here. It’s hard to beat the bright gold color of this tree-in my mind brighter than any self respecting Sugar or Red Maple. It also turns a little sooner than the other trees around it, like it needs to jump ahead of the pack and show off. Fine by me.Having gone from not learning this tree, now I see it everywhere. A row of them are next to Old Chapel heading towards Warner, some younger ones are on Hepburn Road south of Proctor, a similar aged younger one is by HKML, and another glorious old specimen is next to Stewart on the south side. There may be one in the Weybridge Cemetery, but it’s on my drive home and I don’t take the time to jump out and look. This is the week to look for them-they are showing much more color than sugars, and the red maples haven’t even begun to turn as of yet. Some taxonomists think Black Maple is a ecotype, or race, of Sugar Maple, and they often are confused with them. The leaves are considerably different, however. They droop on the edges, slightly, have a velvety silver underside, and only have three distinct lobes. It’s the droopiness that I find to be a good identifier. The bark of the tree is supposed to be darker and more furrowed, hence the name. Our trees on campus seem not to have read that particular book, for they look essentially the same to me. 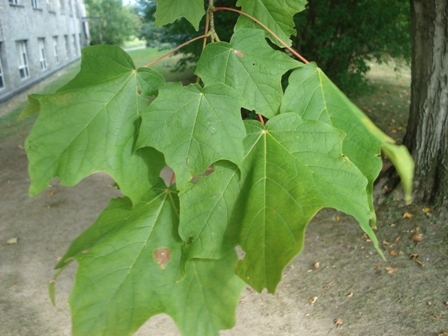 Black Maple does cross breed with Sugars, and there may be a hybrid in between Mead Chapel and Gifford. I can’t make up my mind. It looks a lot sugary, but a little black in the leaves, so it is hard to say. I haven’t been by it lately to see if it is turning. Black Maple is reputably more heat tolerant than Sugars, and are found further south. It is considered a relic from an earlier exerothermic climatic era (warm and droughty). This is considered good news for the species with global warming, as the Black Maple may be better adapted to warmer Vermont climates. They can be tapped for sap equally well, and show similar sugar content relative to Sugar Maple.